Bus company boss Sandy Easdale said his company is investing heavily in new technology and improved comfort to help lure more travellers out of their cars. 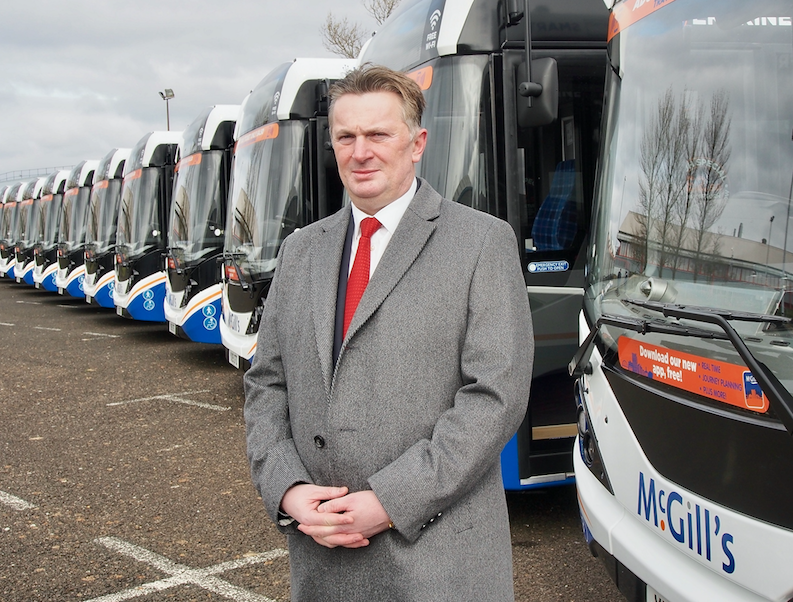 The co-owner of McGill’s, which has just taken delivery of a new fleet of low-emission buses, said that providing new vehicles and ensuring they meet the demands of modern passengers is vital to cutting congestion on the roads. Recent data shows a decline in bus use, partly because of changing consumer habits, such as fewer shoppers heading into town centres, but also because of dissatisfaction over reliability and cutbacks in routes. The government has reduced concessionary grants because of budget cuts. McGill’s ordered 26 buses from Falkirk manufacturer Alexander Dennis last November to serve Glasgow and the west of Scotland in a deal worth £4.75 million. The vehicles are equipped with the latest technology for passengers, including free on-board Wi-Fi and a USB charging socket for smart phones on every seat. They also exceed the Glasgow Low Emission Zone (LEZ) standard which came into effect in the city centre on 31 December. Mr Easdale, unveiling the new fleet today, said: “We’ve made more than £30m of investment in our operations over the past five years, with around £24m focused on new fleet and nearly £7m of infrastructure investment including ticket machines, real time tracking, mobile and contactless ticketing and smart card systems. McGill’s CEO Ralph Roberts believes the new fleet is further evidence of private operators investing to benefit the wider economy.